Hey everyone, I figured it was time I started a thread here to document my progress and current hurdles. I was going to do my own blog on my own site, but I figured that would be more time than what I am willing to dedicate at this time. My name is Jesse, and I am a 32 year old computer programmer specializing in business intelligence. I am looking to make a career change to being a full-time trader and I am hoping to achieve that goal in 5-7 years. I have an MBA from University of Phoenix, not that I expect that degree to help much with trading. As I said earlier, my goal is to become a full time trader. For me, that means replacing my primary job with trading. Ideally, I would spend less than 10 hours a day on trading to make the same amount of money (salary + benefits totaling $90,000 annually). One of the main things that is motivating me for this is the desire for more free time to pursue other interests such as traveling, purchasing rental properties, and perhaps opening a retail store. With trading paying the bills, I can retire from my day job and have complete control of my time. I am sure everyone here has heard from a lot of newbies saying the same things I am. I am sure my story and experiences are nothing new and that others before me have tried and failed. I believe I can do this because other people can do it. As Anthony Hopkin’s said in The Edge, “if one man can do it, so can another”. I am a smart person. I am fairly rational. I believe I can achieve this goal. My other talents as a data analyst (finding patterns in data) and as a computer programmer (automating testing of strategies) can help me be more efficient in what I do, but my main talent of being nearly fully self-educated in most all things will allow me to learn how to trade. My current struggle is with putting together a strategy. As with anything, traders I talk with on the Internet have a wide variety of opinions. However, most everyone says you should find a strategy that you can execute consistently. My struggle is that no one elaborates on what is available to create a strategy! I have demo tested a strategy that revolves around placing buy orders at support levels and sell orders at resistance levels, but that wasn’t profitable. The next idea I had was to find a more mechanical system built around moving average crossovers with RSI confirmation that I could automate via programming to test out, but everyone I talk to says that mechanical systems don’t work. That doesn’t mean I am not going to test one, but it does have me second guessing that decision. Finally, I have a hard time seeing harmonic patterns such as cypher patterns, Gartley patterns, and Bat/Butterfly/Crab patterns. I see double tops, head and shoulders, wedge, triangle and flag patterns fairly easily so maybe I can build a strategy around those. I never like leaving posts like this without trying to determine some next steps I can take to move forward (plus give me a reason to come back and update!). At this point, I would describe myself as unconsciously incompetent, meaning I don’t know what I don’t know. I think the next best thing for me is to review the Education section on this site and try to create a simple, basic strategy that I can back test. I have been fairly stagnant for the last two years as I watched YouTube videos (primarily from Trade Empowered), read books such as The Ultimate Day Trader by Jacob Bernstein, and lurked in forums such as this. Edit 10/15/17: Due to some unpleasantness with a certain member, I need to clarify some things. First, @TradeViper and @cndlstckchic are my trading mentors, and they have free reign to post whatever they want in this thread as long as it is within community rules. I trust them and I value their wisdom, opinions, and feedback. Second, if you feel the need to be a jerk to people, please read the entire thread first so that you have a proper understanding of the context in which to be a jerk. I will still flag you and write a 1,000-word post chastising you for being a jerk as well as flag your every single post in this thread for moderation, but at least you will understand the context of the thread. So tonight after I finished working out at the gym, I went for a walk in the park across the street from my house. It was dark and quiet, so I had plenty of time to think about a trading strategy. I know I want something that is a fairly low-risk strategy and something that has a bit of confirmation. This post is what I came up with. First, allow me to explain my understanding of how markets move. When there are more buyers then sellers, the price goes up. When there are more sellers than buyers, the price goes down. The price finds support where buyers come into the market, whether it’s traders going long at that level or traders covering their short positions. The price finds resistance where more sellers come into the market, which could be traders going short, or traders covering their long positions. Support levels make up the valleys, and resistance levels make up the peaks. A bullish trend is simply a series of higher highs and higher lows, or buyers pushing the sellers back. A bearish trend is simply a series of lower highs and lower lows, or sellers pushing the buyers back. My idea is to wait for the market to enter either a bearish or bullish trend. If the market enters into a bullish trend, wait for price action to fall and more buyers to enter the market. If more buyers enter the market, enter a long position with them. The inverse of this would be the entry rules for the short position. The trick is how to identify the point at where more buyers are coming into the market. My thought is to use RSI oversold indicator and look for a bullish engulfing candle. This would give me two singles that the current retracement is coming to an end and allow me to enter at the close of that candle. The pros of this strategy are that the market is going to tell me what it wants to do, is fairly high probability, and has two different indications. The cons are that markets only trend a small portion of the time, the strategy is hard to automate so I have to test manually which is time-consuming, and the market may signal an end to the retracement and then reverse into consolidation or a bearish trend. The big question I have is not if this strategy would be effective on an hourly or 4-hour chart. I can test that for myself. The real question is the thought process I have in this strategy. Are my logic and the underlying assumptions of this strategy sound? What you have described is a basic retracement strategy. You wait for the market to show you a clear direction (trend), then you look for a temporary pull-back to open a position in the direction of the trend. Fundamentally, that works a good amount of the time. I think the RSI is a poor choice of indicator, however. This is not because I don’t like the RSI - I think it’s one of the better ones, actually - but because the ‘oversold’ and ‘overbought’ of the RSI is probably the worst way to use it. The RSI is intentionally difficult to shift into an extreme, so in a bullish trend, for example, a retracement is unlikely to actually reach ‘oversold’, meaning you won’t get a signal at all. Stochastics would be a better choice, in my opinion, for what you are trying to do, as it is more responsive. Personally, I’m messing about with a 5/8 EMA crossover for trend trading on the D1 charts. So far the results are encouraging, but it needs more testing before I would be comfortable moving it to live. @Drekieyja thanks for the thoughts! I am going to test both the RSI and the Stochastic. I use a bit different settings for RSI than the 14-period default setting. I use a 7 period instead so it moves a bit faster. This morning I sat down with my morning coffee to see if I could test this strategy a bit. Being a computer programmer, my first thought was to see if I could automate the strategy. I did some a few quick Google searches, and found that while my eyes can see the pattern easily it would be a non-trivial matter to teach a computer how to do it. So I figure I will just manually backtest. I loaded up the EUR/USD 240-minute chart with five years of data in my NinjaTrader and I immediately hit a form of paralysis. My brain just locks right up. Pathetic, right? I hit the same problem that I have trading harmonic patterns, and that is identifying the proper swing highs and swing lows. On top of that, I have no idea where to take profits in my trades. Stops are fairly easy as I just plan on placing them at a Fibonacci level beyond the previous swing point. For example, if I am trading a downtrend, then I will take a Fibonacci extension from the previous swing low to the prior swing high and back to the swing low, then set my stop to the 113 level. Profit targets are a bit tricker. I think just to keep moving forward I will set my profit target at a 127 extension of the previous move in the trend that matches the direction of my trade. The next question is do I want to do a one target trade or a two target trade? The one target trade would be easier to manage as I can just set my targets and stops on trade entry, but a two target trade might allow me to stick with winning trades longer. Anyway, I need to run some errands and hit the gym, and then come back to try and get some backtesting done. I had some time before going to the gym to pull up a chart and find a trade that I would like to base my strategy around. After some playing and looking at stuff, I came up with this trade. The stop loss is a 113% Fibonacci extension from the initial low to the retracement. The profit target is a 127% Fibonacci extension from start of the bearish trend to the initial low. The trade would have been entered at the close of the bearish engulfing candle marking the end of the retracement. RSI is configured for 7 periods, not 14. For me, a trend is an impulse leg (or a move that violates previous support or resistance levels) followed by a retracement. If I get RSI confirmation at the first retracement followed by a bearish or bullish candle indicating the end of the retracement I can get involved on that first leg, otherwise, I have to wait for another leg of the trend before getting involved. I think my next step here is to try and formulate a checklist of sorts so that I can start stepping through historical data one bar at a time and backtest this idea. You are of the right mind set. Good luck to you, I should say good journey instead of luck. I am pretty sure I have definitely settled on trading retracements. At this point, my new struggle is to back test my strategy over the last 5 years of historical data to see if there is a mathematical edge - once I figure out my stop and target strategy. Back testing really annoys me because I am afraid of tainting my data because I know how each trade will turn out before I take it because it’s historical data. Part of me is thinking of just demo trading my strategy for 6 months to see how it performs, but I am not sure if 6 months is enough data to account for the seasonality of the markets. Part of me is also thinking of browsing the strategy forum to find a strategy there that I can test out. By doing that I can take advantage of what other people have done with that strategy as a yard stick to measure my abilities by. This morning I was day dreaming about what my ideal life would be like. On a nice fall day, I would be able to wake up in the morning, eat breakfast, and do some trading. After lunch, I would go out to my recreational property and cut some firewood, check on my hunting stands, maybe make some repairs around the cabin. I would come back and my wife and I would go out to supper and then I would come home and check on my other businesses / investments before going to bed. Congratulation for your thinking. Yeah, I was also failed in the beginning of my trading career. And in the first period I was also searching for an effective strategy from which I will earn lot of money. But instead of doing all this things every trader should focus on learning. You can’t make money from part time trading. If you wanted to do proper trading you should invest full time and also learn first. There is no alternative of learning. According to me Forex trading is not comfortable at all for the part timer , because lots of time have to invest in here with patience. so part time is just wasting of time , no one will get nothing from here without passing a long time , you can trade part time in here that’s other issue but of course you have to pass full time for acquiring real market principle if you want to get maximal result. Not completely agree. So many part time Forex traders in this retail market place and some of them are successful. I think , if anyone pass just 3-4 hours in a day and going consistently almost 2 years why not he will be a complete trader ? Everything is possible in here. Just maintain discipline and keep consistency. Firstly, though there is no harm in back testing in order to learn and understand the typical patterns of the market behavior (paying attention to the candles especially and how they react at certain levels and turning points can be very informative), you are very right that it is far different when you are actively making decisions in live time. For instance, on the chart you displayed, your entry and exit points are very logical - but could you pick them out without seeing the trade already played out? Could you sit through over 50 hours of this trade, where much of it was consolidating (sideways) and then even retracing a bit - watching yourself lose your profits? It did drop down to the profit target in due time, but that is the psychological part of it. Not knowing makes us act erratically unless we are very disciplined with our trading and following our plan. My second thought was that though there is nothing wrong with your plan, it doesn’t need to be quite so complicated to be profitable. Simplicity often works best in Forex, simple clean charts and mastering reading them is a core principle in my system of trading. But as long as you feel comfortable with your methods, that is what matters for you - so don’t feel that you have to change based on what I or anyone else is saying. There’s a million different ways to trade Forex, and most of them are terrible. So you have to take everything that others tell you with a grain of salt. If you are lucky enough to stumble across a mentor who is successful and who’s style makes sense to you, that’s when I’d pay attention. Lastly, you mentioned involving s/r lines in your trading analysis, that is very key - when done correctly. Most people who trade price action use the weekly (or even monthly) charts to get the overall market structure and determine where the most important levels are. It’s important not to over do it - there should only be 2 or 3 levels demarcated on your chart in relation to where the price currently is. If you have 20 or 30 lines drawn in, you don’t know which ones are the strongest. In general areas of support and resistance in the recent past are most important. But if you see a particular level that often acted as a reversal point for years and years, with price rarely breaking through - that is an important level, obviously. You shouldn’t always be looking to sell at resistance or buy at support, what you should be doing is watching what price is doing around those areas. It will tell you if it is likely to stall out and reverse, or break through and then retest the area - and the clues it gives are the types of candles it drops. P.S. Just my opinion, but I think that indicators just make you second guess and they are delayed info anyway. You can’t make money from part time trading. I think these two posters are saying the same thing and that is money can’t be made by trading part-time. I think that is 100% completely false. Math can show us that all it takes to make more money is a larger position size, not more time spent in front of the charts. For example, if I go long EURUSD at 1.1756 and exit at 1.1766 that is a gain of $0.0010 for every unit. That means a 1,000 unit position would make me a gain of $1, a 10,000 unit position would make me a gain of $10, and a 100,000 unit position would make me a gain of $100. This is why I have always focused on raising my account balance quickly once I start trading so I can increase my position size faster while still practicing good risk management. Also, for me, a full-time income is $90,000 annually. That means that I either need a strategy that generates 900 profitable trades per year that only capture 10 pips per trade, or 90 profitable trades per year that capture 100 pips, or any other combination thereof. I am not shooting for a seven-figure annual salary here. Thank you! I am posting this so that other traders can comment on and share their opinions. My hope is that people will post things that I hadn’t considered so I can make my plan better. I know I will have a few of those trolls that fall into the 90% of traders that fail and want to bring down anyone else that they can, but on the other hand, there will be a few genuinely helpful people commenting on my plans and thought processes. For instance, on the chart you displayed, your entry and exit points are very logical - but could you pick them out without seeing the trade already played out? Could you sit through over 50 hours of this trade, where much of it was consolidating (sideways) and then even retracing a bit - watching yourself lose your profits? It did drop down to the profit target in due time, but that is the psychological part of it. Not knowing makes us act erratically unless we are very disciplined with our trading and following our plan. I probably couldn’t pick this trade out of live market conditions because the entry signal in this trade isn’t really clear. I really want my entries to be nearly 100% mechanical. Exits I can live with some discretion, but I really want there to be no question in my mind when I enter a trade, and a 100% mechanical entry signal would help me achieve that I think. Part of me is learning towards day trading partly because of the psychology that you describe. Day trades are done at the end of the trading day so I would know my results faster. On the other hand, swing trades have more movement and if my plan has an edge, I would probably make more money on swing trades. At this point, the psychology is an unknown that I plan to address with a small real money account once I develop a method that has an edge that has been proved via backtesting or demo trading. Simplicity often works best in Forex, simple clean charts and mastering reading them is a core principle in my system of trading. Each time I iterate through my strategy I try to increase simplicity. I am not a fan of most indicators, and the only reason why I looked at a moving average cross over was that it could be automated - but automated testing reveals that the best strategy I could base on that was only 42.8% profitable over 7 years. But as long as you feel comfortable with your methods, that is what matters for you - so don’t feel that you have to change based on what I or anyone else is saying. To be perfectly honest at this point, nothing feels comfortable. I really like structure (support and resistance) as well as Fibonacci levels. My next iteration of my strategy is going to incorporate double tops and bottoms as entry signals. I am also thinking about using RSI divergence as a filter to try and increase my profitability but I will need to test my strategy both ways before making that part of the plan. You shouldn’t always be looking to sell at resistance or buy at support, what you should be doing is watching what price is doing around those areas. It will tell you if it is likely to stall out and reverse, or break through and then retest the area - and the clues it gives are the types of candles it drops. Is there any chance you would be willing to share a trade you took based on s/r levels? I feel like I understand what you are saying, but if you can show me a chart that would be super helpful! And a big thanks to all who responded! Does this make sense? So, you are not automatically looking at a s/r line and expecting one and only one thing to happen, you are watching that area for the right conditions to line up - and each one strengthens your likelyhood of a positive trade outcome. Sometimes reversals do happen at s/r lines, but it is MORE likely that the trend will continue. So typically, waiting for price to break through that support or resistance level and then come back to test it and drop a signal candle - aka swing trading, is the safest way to approach identifying trade opportunities. But that does not mean that price will reverse again. Watch and see what price will do at an S/R level…think of them as an area of opportunity. ALWAYS REMEMBER - THE TREND IS YOUR FRIEND, BECAUSE CONTINUATION IS MORE LIKELY THAN REVERSAL. THIS IS WHY YOUR “SELL AT RESISTANCE AND BUY AT SUPPORT” TEST RUN, DIDN’T WORK. Another aspect of support and resistance to cover are MA’s. These can give you clues as to what price will do next, but keep in mind they are based on previous (delayed) data. Notice how during a “run up” or “run down” a trend line, price is touching the MA and bouncing off of it like its support. If price pulls away from the MA and gaps, a reversal is likely. Can you identify the gaps? Public service announcement, there are no liquidity gaps in spot currency, they are caused either by servers turning back on after being off for the weekend, or a latency issue with a retail server, you will never see a gap on an institutional feed. So, you are not automatically looking at a s/r line and expecting one and only one thing to happen, you are watching that area for the right conditions to line up - and each one strengthens your likelyhood of a positive trade outcome. Sometimes reversals do happen at s/r lines, but it is MORE likely that the trend will continue. So typically, waiting for price to break through that support or resistance level and then come back to test it and drop a signal candle - aka swing trading, is the safest way to approach identifying trade opportunities. Ok, so s/r lines are more a trade setup than a trade trigger… by that I mean when you see price approaching a support or resistance line, then you are looking for a reason to enter a trade. So when the price bars don’t touch the MA lines that is a likely reversal signal. Maybe it’s because I am new to all of this that it seems complicated. I spent the weekend testing another strategy that I had read about online. This strategy involves selling a double top if there is bearish divergence in the RSI indicator. For example, on the first bar of the double top I look for the RSI to be above 70, and then on the bar that completes the double top pattern I look for the RSI to be lower than 70. I don’t have enough data to judge the strategy yet as I am only 13 trades into the back testing, but it is looking promising. 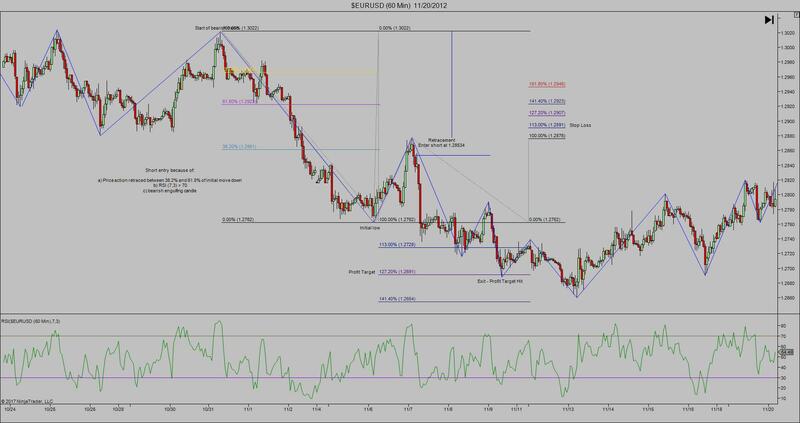 Average winning trade wins around 120 pips and the average losing trade loses around 64 pips. Win rate is currently 77% on the 60 minute chart trading EURUSD. Of course, once I collect enough data to get a clearer picture this may all change but it’s a promising start. Plus the trade entries are really easy to identify, and profit targets are based on the 38.2% and 61.8% Fibonacci retracements of the leg leading into the double top pattern. I use a 113% Fibonacci extension of that same leg as my stop loss target. Thanks for trading lesson @cndlstckchic! Even if I don’t end up using that information, I still appreciate you taking the time to share it! I do like to get in a trade around a s/r level, but it doesn’t necessarily have to be there if the pair is trending well. You always want to have awareness of where they are though. Lets say you see a great trend unfolding and you decide to jump in at a retracement when you see the signal candle drop, however the direction the trend was moving is shortly going to run right into an s/r level and it stalled out and consolidated - or worse, reverses and stops you out. The way that I use MA’s are like clues, if the candles pull too far away from the MA’s - a reversal is likely. Think of it like a rubberband and it’s going to slingshot the other way. You know you can use these ‘skills’ even if your method of trading is completely different than mine - it just adds more understanding to your chart reading abilities which will make you more confident as a trader. These things that I have mentioned apply to everyone, regardless of system. Your strategy with the RSI and double tops / (bottoms too?) looks promising, but I know nothing about that stuff because I learned to trade without indicators and mostly just rely on the price action. Nonetheless as I said before, there are a million ways to trade - so if you find one that you enjoy and works for you - don’t be swayed by everyone else. You’ll hear a lot of “my way is best”, etc., people like to tell others what to do. I just like sharing what I’ve learned over the years, but I hope not in a pushy way. Readers are welcome to take it or leave it. I just like sharing what I’ve learned over the years, but I hope not in a pushy way. You are definitely achieving that. Nothing in your posts have come across as pushy. A quick update on my backtesting. I have 22 trades in my test results across an 8 month period starting in October 2012. The pair I am testing is EURUSD, on the 60-minute charts using a double top (and bottom) entry signal. Stops are at the 1.13 Fibonacci extension of the previous leg, with targets at 31.2% and 61.8% Fibonacci retracements of that same leg. The average winning trade is now 115 pips with the average losing trade at -100 pips. The win rate has fallen to 67% which I am actually pleased with as a win rate over 80% doesn’t seem realistic and suggests that my data might be tainted by confirmation bias. A fictional $2,000 account would have ended up at $3,883 with the biggest weekly loss at -$1,406. Highest account balance would have been $4,115.50 and the lowest balance at $2,053.80. My goal is to backtest 5 years of each of the four pairs in my portfolio before moving to demo trading the same strategy for 3-6 months prior to putting real money in the game.